Venice is a city in northeastern Italy and the capital of the Veneto region. It is situated in a group of 117 small islands that are separated by canals and linked by bridges. These are located in the shallow Venetian Lagoon, an enclosed bay that lies between the mouths of the Po and the Piave Rivers. Parts of Venice are renowned for the beauty of their settings, their architecture, and artwork. The lagoon and a part of the city are listed as a World Heritage Site. In 2014, 264,579 people resided in Comune di Venezia, of whom around 55,000 live in the historic city of Venice (Centro storico). Together with Padua and Treviso, the city is included in the Padua-Treviso-Venice Metropolitan Area with a total population of 2.6 million people. Venice was a major financial and maritime power during the Middle Ages and Renaissance, and a staging area for the Crusades and the Battle of Lepanto, as well as a very important center of commerce (especially silk, grain, and spice) and art in the 13th century up to the end of the 17th century. The city is considered to have been the first real international financial center which gradually emerged from the 9th century to its peak in the 14th century, making it a wealthy city throughout most of its history (Source: Wikipedia). Venice has been a source of fascination for centuries for a variety of reasons including, rightly so, its architecture and urban design. In many ways, Venice seems unique. Its island location seems to allow the city to operate as an ‘almost discrete’ urban system. At least, much more so than most cities. It incorporates a mix of transportation modes including pedestrian paths, a rail station, ports, and internal water navigation, e.g. the canals. 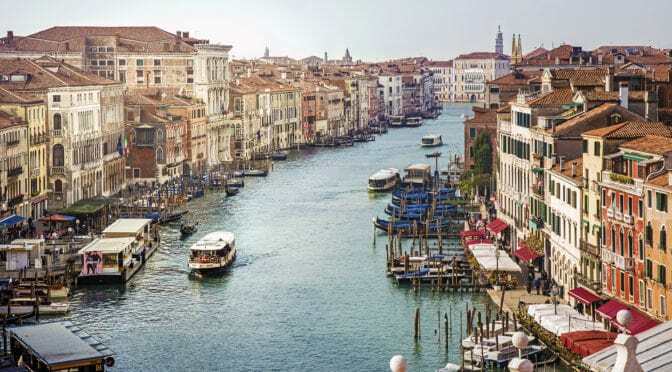 Venice is an urban pattern ‘frozen in time’ because of historical conservation efforts during the 20th century, almost as much – if not more so – for maintaining the delicate man-made ecosystem of Venice due to subsidence (i.e. gradual lowering of the city into the sea) as for architectural and urban design aesthetics. Venice is ‘frozen’ into its deformed grid layout much in the same manner as the Pilot Plan of Brasilia is ‘frozen’ in its modernist, geometric layout. 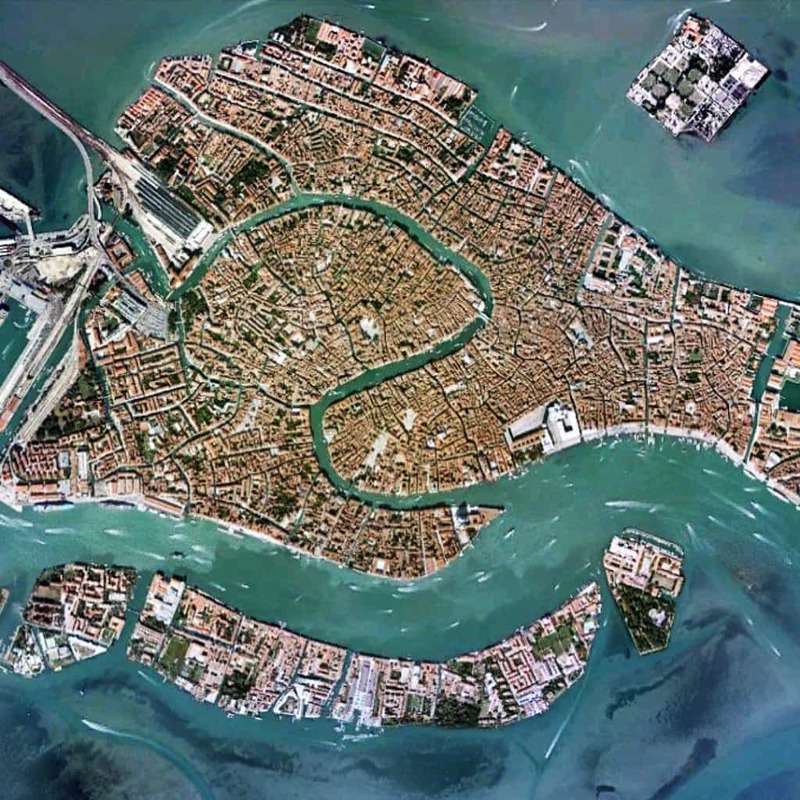 Satellite view from 5 km of Venice, Italy (Source: Google Earth). Nonetheless, there are many interesting things to note. The intricacy of the deformed grid layout indicates a well-defined and easily-understood neighborhood pattern in Venice, despite the lack of a readily-apparent geometry in the ‘bird’s eye view’ of the layout. Block sizes appear larger and more geometrically regular at the outer edges of the island (for example, to the north at the water’s edge) and smaller towards the center of the island (for example, at the bend in the Grand Canal). Venice’s street system also seems to have evolved over time to privilege the edge-to-edge relationship from one shoreline to another with longer, straighter streets intersecting these streets for transverse movement, especially closer to the outer edges of the island; for example, to the north and south. This leaves the patterning of the center-to-edge relationship for movement in the Venice urban network to the canal system itself, especially in the relationship between the rail station located at the water’s edge to the west and the Grand Canal itself. Collectively, this seems to represent something of an European inversion (and a very particular one at that) in formal terms compared to the suburban street network pattern of post-war American cities (such as Las Vegas or Phoenix), where very long edge-to-edge, super grid streets are geometrically determined by the cardinal directions and interstitial streets tend to be shorter by comparison. Nonetheless, the dynamic of Venice’s train station in relation to this urban pattern is somewhat replicated by the airport in the American model.